I've written before about The German Tank Problem. Basically, it's a problem in which you try and estimate the number of tanks being produced by the enemy, based upon the serial numbers of the ones that were knocked out. This was a real problem from World War II, but is now often sold as the taxi problem, in case you are too sensitive to think about tanks. The moral of the story is that the spooks and spies were wrong, and the mathematicians right. Yay!!! I was happy with this until my post on this (which was almost a year ago). My ex-student, and Bayesian extraordinaire, Brendon Brewer, said something that bothered me. Namely, the chance of seeing a tank depends on the number of tanks, with more chance of seeing one if there are more of them (obviously! ), and this seems to cancel out the effect of knowing the serial numbers of the tanks. So how could it work. I had a good week and so decided to return to the problem. It sometimes comes as a surprise to non-astronomers that one of the hardest things to do when you look at the Universe is to measure distances to objects out there. People have head about the almost 100 year battle to measure Hubble's Constant, but what people fail to realise is that all of the uncertainty was in measuring distances; how far is it to that galaxy, or that supernova, or that star. Books have been written about the titanic struggle of measuring and calibrating distances in the Universe, so I am not going to cover that here again. But let's talk about my (and my collaborators) effort in the field. I've written before about some work I've been doing with PhD student, Anthony Conn, using the tip of the Red Giant Branch to measure the distances to the dwarf galaxies orbiting our nearest neighbours, the Andromeda (M31) and Triangulum (M33) galaxies. "What would happen if I stopped using a cube, but instead had two parallel sheets? Now, in this case, I don't have a closed surface anymore, but if I make my sheets infinitely large, I am guessing that the total integral over the two sheets would converge to the result expected by Gauss's law." Anyway, this is not going to be a long post, as I haven't had any coffee yet, and have a paper to deal with, but I am very quickly going to scribble down the solution. Basically, I am going to replace my square piece with a circle, and then make the circle infinitely large in radius, and this will be the same as making a square sheet infinitely large. It has been a busy week, with a talk to the Macarthur Astronomical Society on Monday, and to the Astronomical Society of New South Wales last night. And if you were in Blighty on Wednesday at 4am, you would have heard me join dr karl on Radio 5 Live's graveyard shift to talk about why high speed protons don;t become black holes, but that is the topic for another post. 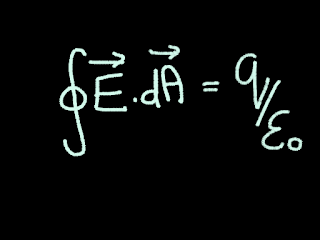 As I mentioned, I've recently been teaching electromagnetism, and I like to take a little bit of a side-ways glance at derivations and equations. Why? Because sometimes those given in text books can appear a little too idealized or simplified. 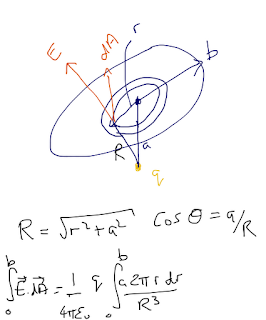 One of the things that you have to talk about in electromagnetism is Gauss's law. Mathematically, Gauss's law can seem quite intimidating to a first year student, even those in our advanced class, but let's take a look at what it means in a simplified sense, and then something a little more complicated. These are amongst the most important equations in the Universe. Why? Well, there are 4 forces in the Universe, two of which we generally don't worry about on a day-to-day basis (namely the Strong force which holds the nuclei of your atoms together, and the Weak force which is responsible for radioactivity), gravity, which wants to drag you to the centre of the Earth, and electromagnetism, which is responsible for everything else.